Journal of Youth Studies is an international scholarly journal devoted to a theoretical and empirical understanding of young people’s experiences and life contexts. Over the last decade, changing socio-economic circumstances have had important implications for young people: new opportunities have been created, but the risks of marginalisation and exclusion have also become significant. This is the background against which Journal of Youth Studies has been launched, with the aim of becoming the key multidisciplinary journal for academics with interests relating to youth and adolescence. 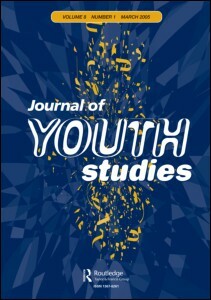 Journal of Youth Studies is focused upon young people within a range of contexts, such as education, the labour market and the family, and highlights key research themes such as the construction of identity, the use of leisure time, involvement in crime, consumption and political behaviour. The journal particularly encourages the submission of articles which highlight interconnections between the different spheres of young people’s lives (such the transition from school to work) and articles which offer a critical perspective on social policies which affect young people. Journal of Youth Studies brings together social scientists working in a range of disciplines. These include sociology, psychology, education, social policy, political science, economics, anthropology and social geography.